Award Winner!!! 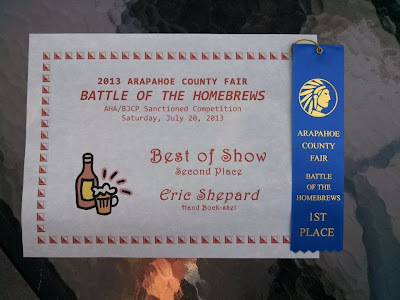 2nd Place Best Of Show 2013 Arapahoe County Fair Battle of the Homebrews. I declared that I was going to try to brew all-grain batches in all the BJCP Categories that I have not brewed in (see SheppyBrew Styles). Category 5 Bock was one of those missing styles because I had not brewed an all-grain version. Helles in a Hand Bock-sket is my Bock category recipe from the 5A. Maibock/Helles Bock subcategory. The recipe is very simple, using only German Pilsner and Munich malts along with some Magnum hops for bittering. It uses harvested WLP830 German Lager yeast from Khazad-dûm Black Lager, and is the conclusion of my German lager trilogy. The result will be a big, rich, clean, smooth light colored beer. I am planning on brewing this early March and should be trying it by June. I hope to put some of this away to age and try from time to time. Not that anyone will buy any, but I created a bumper sticker in my Zazzle store for this beer. I shared this page on the SheppyBrew facebook page with a comment "Will drink in May". One of my facebook friends noted that "Will drink in May" sounded like a statement or like and event. It reminded her of "will work for food" only not "so sad or needy". She thought I should make a bumper sticker. Or don't ... either way. Entered this beer into the 2013 Arapahoe County Fair Battle of the Homebrews. It got 2nd place in the Best Of Show competition, which makes me very happy. Adding 3g CaCO3 to get close to Munich water profile in Beer Smith. Use harvested yeast from Khazad-dûm Black Lager. A week before brewing, make a 3 liter starter. Let ferment out, cool, decant, and make another 3 liter starter with the resulting yeast. Cool wort to below 55 degrees before pitching. Ferment for 2 weeks as close to 55 as possible. After 2 weeks, let temperature rise into mid to upper 60s for a week. Let condition at least 2 months. Day 1: 50 degrees quick start. Day 3 - 5: 55 degrees active. Brewed this up. No issues. Hit all the numbers about perfect. Fermenting in 5.5 better bottle in an ice bath. Fermentation started off quick right around 50 degrees. It did rise up to 55ish for its most active fermentation. Today, the kraussen is starting to fall and the beer is at 58 degrees. Today or tomorrow I will remove it from the cold water bath and let it rise into the low 60s. Took a gravity reading. Is higher than I expected ... around 1.024. I took out of the water and am letting it heat up to ale temps. Sample tasted real good. Obviously a bit sweet, but pretty good. Took another gravity reading. Am at 1.018 now, which is much more respectable. Put this in secondary to make room in the bigger BB for Buckwheat. FG down to 1.014, which means I am at about 7.4%ABV. I added in about an ounce of table sugar to hopefully help scrub O2. Sample tasted awesome. Kegged today. I am calling the FG 1.013. Sample was a beautiful gold. Nice and clear. Very malty. Cannot taste the alcohol. Put the keg outside in the snow to help chill a bit. Don't have space in the keggerator, so I will have to ice this keg, but for today, Mom Nature is helping out. Had some through my picnic tap. I am not going to lie. I love this beer. Smooth and creamy. Lots of bready Munich malt flavor and aroma. Rich and sweet to begin. Enough flowery hops and bitterness to give some balance. Hands down the best Maibock I have ever had. Sent some to the Arapahoe County fair. Might be a bit old to do well, but I guess we will see. Last time I tasted a bottle I still thought it tasted good. I guess the beer was not too old to do well. I got 2nd place in the Best Of Show round at the Arapahoe County fair. Awesome. Didn't realize I had one. Wasn't expecting it to be very good, but it was not bad at all.